Home HEALTH DOCTOR PROFILES Michael Hulin, M.D. What role does your primary care physician play in managing your longterm wellness? According to Dr. Michael Hulin, family medicine physician at East Jefferson General Hospital, the answer is likely to be more and more in the coming years. Dr. Hulin’s interests in nutrition, exercise and even sports medicine inform all his patient visits, and he takes the time at least once per year to assess diet and fitness goals. He has special handouts on exercise and food guidelines. He’s also an advocate for self-care since mental health is as much a part of wellness as physical wellbeing. Word has spread that he’s “that” kind of doctor, so more patients interested in wellness are seeking him out. “I’m much more enthusiastic talking about [wellness] than yet another prescription medication,” he says. But for those not yet onboard, he enjoys the challenge of helping the patient become equally invested in their health as he is. Dr. Hulin feels it’s time to accept that we’re less active than even a generation ago. Our grandparents didn’t focus on diet and exercise; their busy lives on farms, in yards and in active jobs kept them fit. We’re outside less, eating more and eating more processed foods. It takes diligence now to keep our bodies healthy, he says. That’s just one reason he is a big advocate for the Exercise as Medicine program at East Jefferson’s Wellness Center, where patients are given diet and exercise tailored to their lifestyles and chronic conditions. He says his patients using the service are making strides in their health and reducing their need for medicine. So many mentors: Though he was always more interested in literature than science, the path for healing and helping people was laid by his Cajun folk healer grandmother and all the home remedies his family from Breaux Bridge employed for comforting illness: honey; hot tea with lemon; eucalyptus chest rub; even prayers. 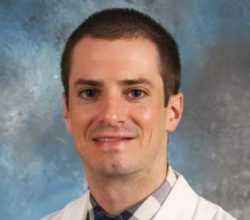 In his residency at East Jefferson, he met his mentors who he says he feels fortunate to work shoulder to shoulder with today caring for patients and training the next generation of family medicine physicians through EJ’s residency. Finally, his closest mentor is his wife, who he met over a cadaver at medical school (“over our dead body,” he jokes). She’s finishing pediatric residency at Children’s (after giving birth to two beautiful sons, Felix, 2, and Henry, 2 months), and they hope to someday collaborate to offer full spectrum medical care for families.